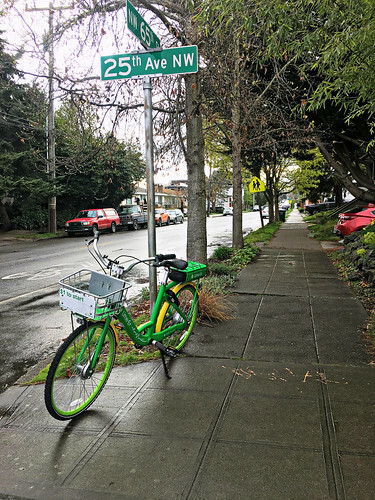 ✨New✨ designated bike share parking areas in Ballard! 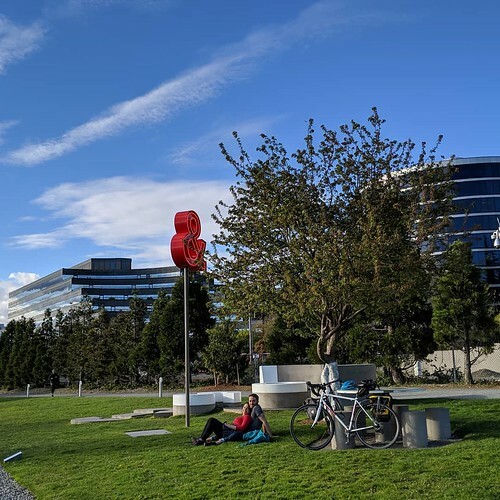 To help better organize bike share bikes where we’ve seen lots of use in the city, we’re experimenting with designated bike share bike parking areas. 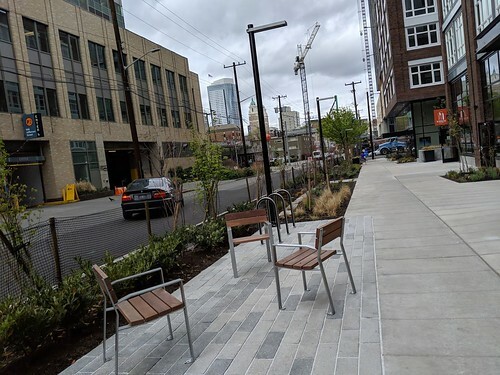 We’ve selected five “sidewalk furniture zone” locations along NW Market St in Ballard where we’re encouraging bike share users to park their bike share bikes. 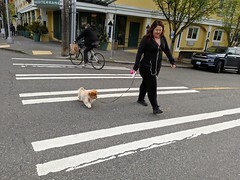 The five designated parking locations have temporary markings and we’ll to determine how effective they are in helping to better organize the brightly colored bikes. 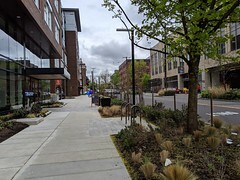 North side of Market just west of Ballard Ave (in front of Shakti Yoga). NE corner of Leary and Market (Ballard Beer Company). SE corner of Leary and Market (AT&T store). SW corner of Tallman and Market (All the Best Pet Care). North side of Market just W of Russel (Kangaroo and Kiwi). 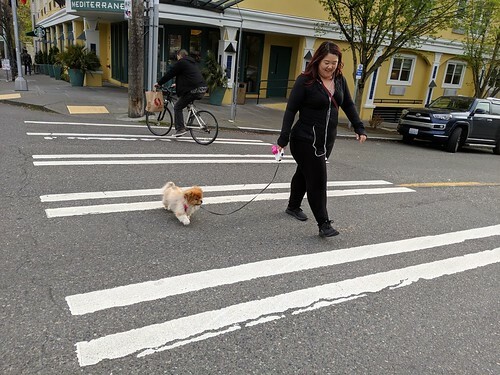 Have space for a 6’x10’ parking area, leaving a full 6’ clear continuous pedestrian path. Were 3’ back from the curb if adjacent to travel or parking lane. 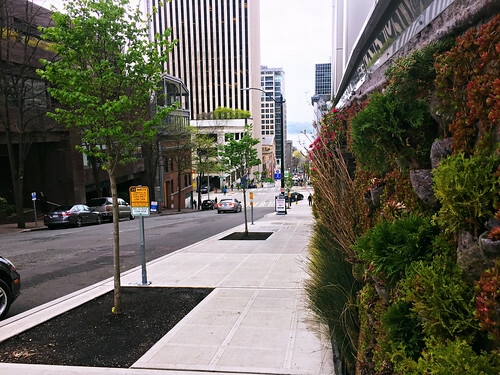 Are not blocking access to buildings, transit, curb ramps, or loading zones. Are an area where bike share bikes are often found. The number of bikes in the immediate vicinity of the parking area and how many are parked correctly. The number of bikes in the neighborhood and how many are parked correctly. Do the bikes appear more orderly? How are the markings holding up? Learn more about our Free-Floating Bike Share Program! For more info about our bike share program, visit our Free-Floating Bike Share program page. You can also visit our Bike Program page where you’ll find our Bike Map and more helpful info. Ride Seattle Streetcars for FREE on Tues., Dec. 12! South Lake Union Streetcar, Seattle. 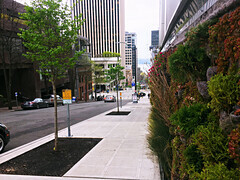 Happy Anniversary South Lake Union Streetcar! Tuesday, December 12, marks the tenth anniversary of service for the South Lake Union line of the Seattle Streetcar. In celebration of ten years of service, all rides on City of Seattle streetcars will be free on Tuesday, December 12, 2017. Thank you for riding Seattle streetcars! 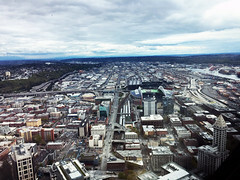 Seattle has grown leaps and bounds since the South Lake Union Streetcar launched on December 12, 2007. South Lake Union (SLU) was already showing signs of growth from the early 2000’s. 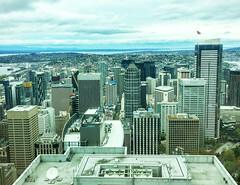 There were 2.2 million square feet of office space pre-2004 with about 21,000 jobs. 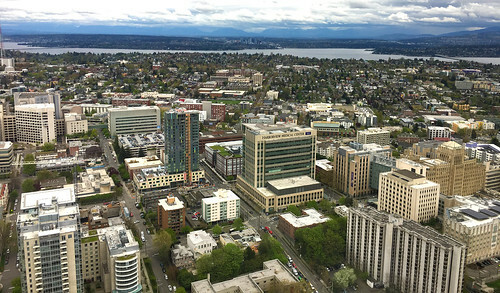 Now there are 11.6 million square feet of office and life science space with 52,000 jobs! As for housing prior to ’04 there were 1,200 units for sale and rent, in 2017 there are 11,700 units for sale or rent. As Seattle’s unprecedented growth continues, we’ve added more reliable, more frequent, and faster transit service with the extension of the RapidRide C Line to SLU in March 2016. We’re excited that you can share in celebrating 10 years of Streetcar service by taking a free ride. Look for more similar ride opportunities in the weeks ahead. The First Hill Streetcar launched service in January 2016 joining SLU as the City’s second streetcar line. 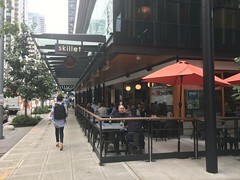 The Center City Connector is the missing link that will join the South Lake Union and First Hill Streetcar lines, creating new north-south connections that will allow for easy rail transit connections throughout the core of downtown. 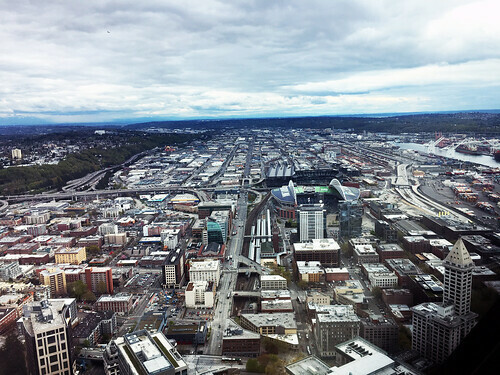 Construction began in fall 2017 and will provide better transit connectivity to Pike Place Market, Seattle Art Museum, Link light rail at Westlake, Pioneer Square, and the stadiums. 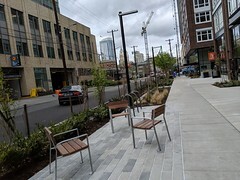 We look forward to celebrating the completion of the Center City Connector and having more choices in getting around our great city. Ride the Seattle Streetcars for FREE on Tues., 12.12.17! On-street parking changes in Wallingford? SDOT wants to hear from you! We recently completed a parking study of residential streets in Wallingford surrounding N 45th St./NE 45th St., in response to a request from the Wallingford Community Council for new and/or expanded Restricted Parking Zones (RPZs). We’re sharing the results of the study with the community in Wallingford and are seeking feedback on potential on-street parking changes. Are usually in effect during the day (for example, from 7 AM – 6 PM). 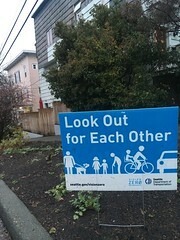 Can be on either one or both sides of the street. Allow residents to park longer than the posted time limit via permit. Allow unrestricted parking when the signs are not in effect. What happens next? We want to hear from you! We’re collecting feedback through November 30, 2017, by survey, email, and over the phone and plan to present a draft proposal to the community in early 2018. Fill out the survey 👉 here 👈. If you live in the neighborhood, the information might already be in your mailbox! 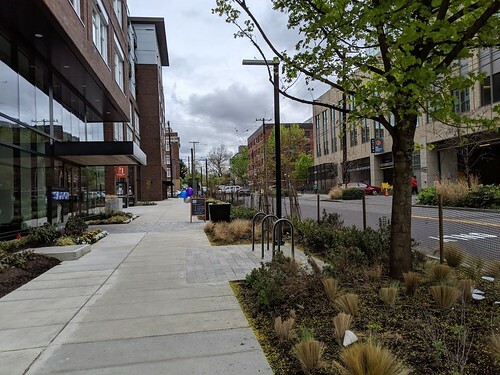 You can also get more detailed information about the Wallingford study results and recent RPZ work in other neighborhoods. Carsharing, biking or bussing it? When traveling around the city, it’s all about options! 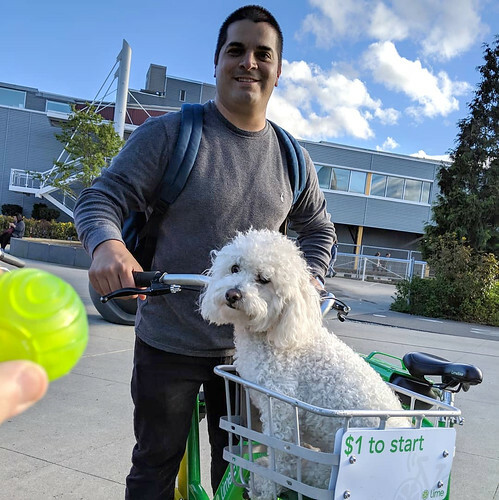 That’s why we recently got together with Commute Seattle, ReachNow, and LimeBike to give commuters in the South Lake Union neighborhood the low down on their choices to help them get to and from work. 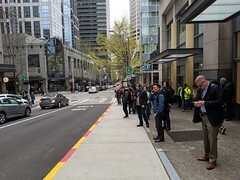 Nearly 250 people stopped by our lunchtime transportation fair on Westlake Ave to hear more about taking transit, carpooling, bikeshare, and more. Bonus – people who came by also got free coffee and donuts! 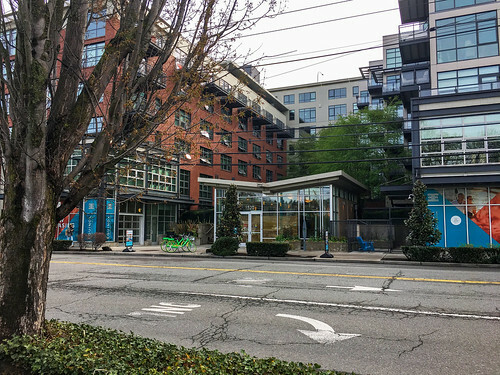 Learn more about South Lake Union commuters access transportation options right here. We’ve released our second annual performance report about voter-approved Proposition 1, which created and funded the Seattle Transportation Benefit District (STBD) to purchase more bus service from Metro, specifically for Seattle residents. The year two report shows that the voters’ investment continues to translate into major transit dividends. STBD increased service by more than 30 percent on key Transit routes. In two years, STBD increased access to frequent transit service from 25 percent to 64 percent of households. Ridership is up across the board on our RapidRide lines, including a 40 percent increase on Rapid Ride C, with all three buses meeting their schedule nearly 80 percent of the time. Working with King County, the percentage of low-income residents using ORCA Lift, our discounted ORCA card program, has nearly doubled, going from 11 percent of eligible riders, to almost 20 percent. We’ve gotten pre-paid Orca Cards to 2,680 low-income middle and high school students, generating 440,000 student Orca Card trips and saving $648,000 for them and their families. Voters, government accountability watchdogs, and total transit nerds can dig in to the all the data in the Year Two Performance Report. In 2014, voters passed Proposition 1 by 62-percent, which created and funded STBD. 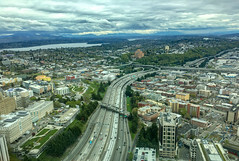 The funding measure includes a $60 vehicle license fee and 0.1 percent sales tax increase to generate about $50 million annually for six years (2015-2020). 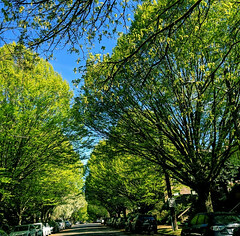 STBD’s successful first year included adding 270,000 more annual service hours on 68 routes, and a 26-percent addition of 71,000 annual hours for RapidRide C, D, and E lines.